Two ambitious missions in progress plan to grab pieces of space rocks and bring them back to Earth for further study. There has only been one successful mission to an asteroid so far. The planners of the New Horizons mission did not actively consider any targets on the asteroid belt, to conserve fuel. However, there was an asteroid close enough to observe on the way, called Asteroid 132524 APL. The spacecraft studied the properties of this asteroid and used it as an opportunity to test out the imaging systems on board. Now, two space agencies are leapfrogging to the next step – missions that will go to an asteroid, gather some of the material, and bring it back to Earth for further study. In June 2018, the Hayabusa 2 mission by JAXA, rendezvoused with 162173 Ryugu, a near-Earth carbonaceous asteroid. Studying this type of asteroid will allow scientists to find out more about the formation of the Earth, and maybe even about the origins of life. The Hayabusa 2 is a solar-powered spacecraft with ion propulsion. Hayabusa 2 is expected to conduct experiments on Ryugu until the end of 2019, after which it will begin its return journey, with a plan to reach home by the end of 2020. There are plans to obtain three samples from various locations on the asteroid. Two of the samples will be obtained through a sampling horn. This horn fires a tantalum bullet to the surface of the asteroid and captures the ejected material directly. These two are the surface samples. The third sample will be a subsurface sample. Gathering the third sample involves reaching deeper into the asteroid, to gather material that has not been affected by space weather or heat. 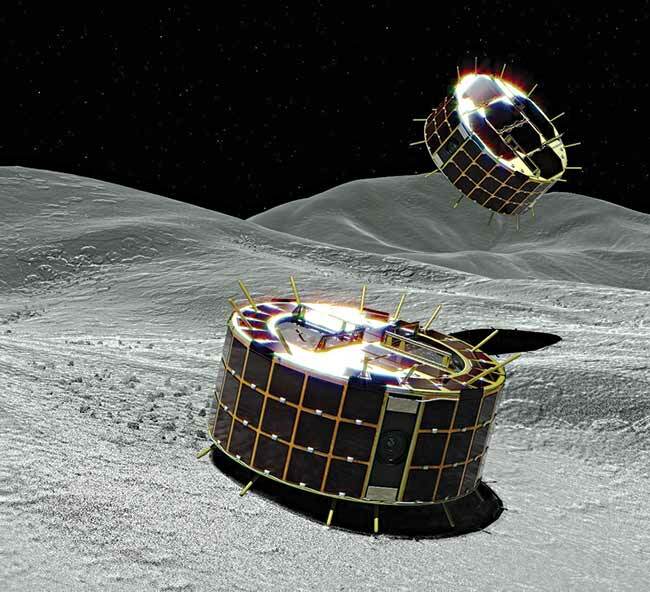 To do this, Hayabusa will essentially detonate an explosive on the surface of Ryugu. The explosion is expected to create an artificial crater that is two meters wide. Then Hayabusa 2 will wait for two weeks for all the dust from the explosion to settle down. After that, the spacecraft will visit the new crater to collect its third and final sample. Hayabusa also has four rovers on board. These rovers will explore the asteroid, and provide additional contextual information for the returned samples. There are three hexagonal Micro Nano Experimental Robot Vehicle for Asteroid (Minerva) rovers on board, which are equipped with cameras, are autonomous, and will hop across the surface of Ryugu like robotic grasshoppers. The rovers have adopted the hopping strategy, considering the low gravity environment on the asteroid. In September, the two Minerva rovers successfully landed on the asteroid. They are equipped with colour cameras and are in the process of surveying the asteroid, as well as capturing stereoscopic images. The fourth rover, called Mascot was developed by the German Aerospace Center. Mascot had a rather short mission duration of under 17 hours but managed to pack in a lot of science during that time. After landing on the asteroid on 2 October, it visited the south pole of the asteroid, found some rather large boulders, and found very little regolith, which was a surprise. Origins, Spectral Interpretation, Resource Identification, Security-Regolith Explorer (OSIRIS-REx) launched on 8 September 2016 and is on its way to 101955 Bennu. The spacecraft is expected to rendezvous with the asteroid towards the end of the year. On approach, the spacecraft will start mapping the asteroid to choose a suitable site for gathering the sample. This is expected to be an extensive remote sensing campaign. The strategy used to gather the sample is very different from the one used by Hayabusa 2. OSIRIS-Rex will not really land on the asteroid at all. Using the low gravity, it will reduce the altitude of its orbit until it is almost grazing the surface. 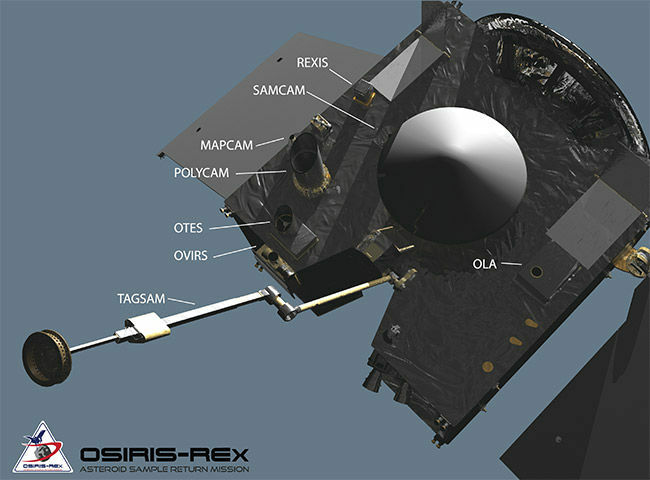 Over the course of the observation campaign, OSIRIS-REx will study chemistry, mineralogy and global properties of the asteroid using the onboard instruments. During this period, a number of practice manoeuvres will be conducted, without actually gathering the sample. The two solar panels on board will be deployed in a Y shaped configuration. This is to minimise the accumulation of dust on the panels during the sample gathering process and to minimise damage to the spacecraft in case it tips over and gets uncomfortably close to the asteroid. NASA has developed a touch-and-go sample gathering arm, which hangs below the spacecraft. If all goes well, this arm is the only part of the spacecraft that will touch the surface. After a few practice runs, the actual sample gathering will be attempted. This is a complicated process considering that the arm has a very small time window to actually gather the sample. Once deployed, the arm will make contact with the surface of the asteroid, through accelerometers. A spring mechanism on the arm acts as a shock absorber, protecting the spacecraft from the jolt of the impact. A burst of nitrogen gas will throw small particles of the regolith into the collector. After five seconds, the spacecraft will automatically increase its altitude and check if enough material has been collected. If the sample is not of sufficient quantity, then the spacecraft will attempt to gather it again. There is enough nitrogen gas on the arm for a total of three attempts. The sample gathering success of OSIRIS-REx is contingent on sufficient regolith to be available at the gathering site. JAXA and NASA are actually working together on both the missions. Both the OSIRIS-REx and the Hayabusa 2 missions hope to return samples from asteroids formed very early during the creation of the solar system. As such, the asteroids can be considered time capsules, that will allow scientists to study the origins of the solar system and the Earth. To do this as accurately as possible, the scientists require as many samples, from as many diverse locations as possible. Either asteroid may be an outlier case, instead of the norm. The specific sites from which the samples are gathered may also have unusual properties. The idea is to ensure that the returned samples are representative of carbonaceous asteroids. Towards this goal, the samples from the two missions will be shared with the scientists from the other team. 10 per cent of the Hayabusa 2 samples and 0.5 per cent of the OSIRIS-REx samples will be shared with the other team. The discrepancy is because OSIRIS-REx will be returning a much larger quantity of material than Hayabusa 2. Additionally, to ensure a deep collaboration, there are JAXA scientists in the OSIRIS-REx mission and NASA scientists in the Hayabusa 2 mission. At this point in time, these are the only two asteroid sample missions. There are two planned future missions to asteroids, neither of which are sample return missions. The Lucy mission will explore the trojan asteroids of Jupiter, a group of objects captured from the asteroid belt. The Psyche mission is to an m type asteroid of the same name. Lucy and Psyche are both missions planned by NASA as part of the Discovery Program.